Traditional Only a boy named David This is fun and very old Sunday School song, which I think is still fun, especially with actions! Free sheet music (loads a pdf). Good for kids. TiS 561 / AHB 467 / NCH494 / CH535 / LBW498 / A&M823 / CP(E) 621 / 82Hml-684 / Lau862 / MP224 Who would true valor see / valour see (John Bunyan) A lovely old hymn, with old-world imagery. I think it still works OK. TiS and NCH have inclusive language throughout. CH and CP(E) do not have inclusive language, even for humanity. I really like the tune MONK'S GATE. Particularly nice with light instrumentation. A violin / flute and a bodhran may be all you need for this. Inclusive lyrics (loads a Word document). Oldy-but-a-goody. Iona (M&G, T1AU) / MV099 / GC(II)673 / G(3)763 / Lau996 / LUYH445 Stand O Stand Firm (Cameroon) I love having an excuse to sing this simple and powerful song. Very easy for your congregation. You can make up cantor parts too “Oh my sisters…. Oh my brothers… Oh my children….” or you can name countries you are praying for in your intercessions. Good for kids. Scottish sound sample. Lead sheet. Online Resource Hear the message we now are proclaiming / El mensaje que hoy proclamamos (Eleazar Toregoza) This jubilant Colombian song of liberty and new life for the poor and suffering would fit well with this reading. This energetic song is not hard to sing, and if the congregation sings only the chorus, while a cantor sings the rest, they will be able to easily sing along by the 3rd verse without stress. Free sheet music. ATW 463 / Iona (T1AU) / ELW721 / SFFS 2219 / A&M835 / GtG750 / GC(II)451 / G(3)528 / W&R296 / URW436 / LUYH707 Goodness is stronger than evil (Desmond Tutu / Iona) W"Victory is ours, victory is ours, through him who loves us". Some congregations change the last line to "Compassion is ours, compassion is ours...". It depends on the context in which you sing it, I suppose. Sound sample. Good for kids. God does not forget the needy. The songs listed for the 1 Samuel reading would also be good for this reading. Online Resource The holy heart of justice (Richard Bruxvoort-Colligan) An inspiring, gentle song. This would be good sung by the musicians at first. "The helpless will not be forgotten". Lyrics, sound sample and sheet music. PfAS009C / LUYH647 Come sing to God with all your heart (Ruth Duck) Great words to the familiar tune MORNING SONG (but can also be sung to many other tunes). Lyrics (downloads Powerpoint slides). Sound sample. New words to old tunes. TiS 617 / NCH413 / UMH517 / WoV736 / ELW626 / A&M605 / GtG818 / PH342 / W&R75 / SP164 / 82Hml-695 / Lau428 By gracious powers so wonderfully sheltered (Dietrich Bonhoeffer / Fred Pratt Green) Wonderful words by Bonhoeffer. Lousy tune. Words fit well to O Perfect Love if you find the tune too tricky. Can also be sung to BERLIN or INTERCESSOR. The 5th verse is omitted in some hymnals. Lyrics. New words to old tunes. NCH Psalter009 You O God have not forsaken those who seek you (Elaine Kirkland) A slightly tricky, but joyous refrain and chanted Psalm. Lead with confidence! CH175 / GtG628 Praise I will praise you Lord with all my heart / Je Louerai L’éternel (Claude Frayssee) Good words; tune is a little schmaltzy, but easy to sing once heard. GtG356 / PfAS009B Sing praise to God whose mighty acts (Carl P Daw) A good paraphrase of the Psalm; some words are quite strong, but so is the psalm. Tune is quite straightforward. Lyrics and sample sheet music. Iona (SBL) / MV068 / G(II)405 / GC581 / GtG578 / PfAS009A Kyrie Guarany / On the poor, on the poor (Traditional Paraguayan Tune / Pablo Sosa) A simple Kyrie from Paraguay; This is our current favourite at Brunswick. The English translation varies depending on the source (we don't sing On the Poor). Sound sample (track 12). Good for kids. *Iona (LFB) / Lau930 Listen Lord (John Bell / Graham Maule) Beautiful chant-like chorus, can be used on its own or as a response, or used with the verses. Good to use for the intercessions. How good it is when kindred live in unity. Oil running down the beard and dew on mountains. *Singing from the Lectionary Exclusive! Behold how good and Oh how pleasant (Noelle Damico) A beautiful chant that I remember every time I read this Psalm; I have an old photocopy of it and Noelle has given me permission to post it here, complete with my husband's guitarist scribbles. It can be sung as a simple chant, or sung with a responsive bilingual reading of the Psalm (Spanish/English) or really any way you like. You can access the file here. Please let Noelle know if you use this (revdamico_at_gmail.com). Good for kids. *Emergent Psalter How good it is (Isaac Everett) A good 3/4 swung Psalm refrain to a read Psalm. Sheet music (response) here. *NCH Psalter How pleasant to live in unity (Hyeon Jeong) A simple Psalm refrain for a chanted or read Psalm. *Online Resource The blessing of life forevermore (Richard Bruxvoort-Colligan) A joyful song, with a simple refrain. I think this would work well either by using the chorus as a Psalm refrain, or by using both the chorus and verses intersected with a reading of the Psalm. The verses would be better sung by a soloist initially. I think the refrain would also be great sung more uptempo with some solid gospel harmonies... at least, that's what's happening in my head. Lyrics, sound sample and sheet music. GtG398 / PfAS133C How very good and pleasant (Barbara Boertje) This is sweet; perhaps a little mushy. I think older congregations would quite like this chorus. Sound sample. PfAS133B Behold how good and delightful (Traditional Puerto Rican) A simple short song in English and Spanish sung to a traditional Puerto Rican tune. 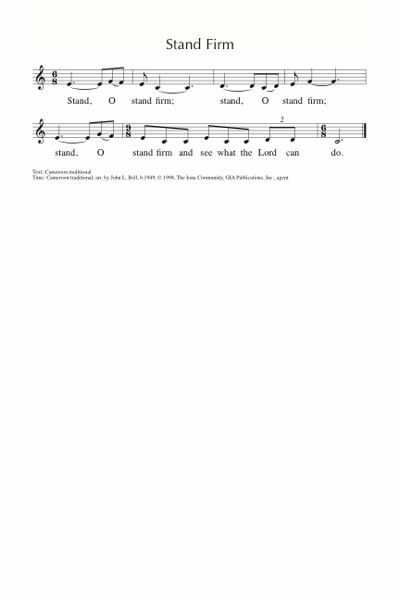 Cha764a Unite us God unite us in your everlasting love (Unknown) Simple sung response, and responsive reading. *G(II)525 / GC727 / SP244 / URW335 How Good It Is, what pleasure comes (Ruth Duck) Good words celebrating the joy of a faithful community. Sung to a familiar shape note tune. Lyrics and sample sheet music. Midi file of tune. AoVK-113 Thank you O Lord for this world of ours (Barr) A good kids song in two parts. Good for kids. Psalm Project: Sharing the Road (Richard Bruxvoort-Colligan) A cool rock song based on the Psalm with an excellent chorus. Sound sample, lyrics, theology and songbook available here. Good for kids. Now is the day of salvation. Paul et al suffer much, but although seen as imposters, they are true. TiS 607 / AoV2-126 / ATN 95 / CH528 / VU684 / StJ / A&M725 / SFFS 2171 / HPP406 / GtG753 / G(II)524 / GC726 / GC(II)721 / G(3)828 / CP(E)519/ W&R587 / Srce 462 / Lau898 / StF707 / MP456 Make me a channel of your peace (Sebastian Temple). Lovely. Nice if you can just start a capella... Youtube video of Sinead O'Connor singing it and lyrics Oldy-but-a-goody. NCH495 / HPP443 / GtG761 / PH343 / W&R581 Called as partners in Christ's service (Jane Parker Huber) A good song of commitment - particularly good if you are comissioning people to new roles this week, and good for any other service too. Sung to a standard tune. *CH527 / A&M717 / SP290 / 82Hml-593 Lord make us servants of your peace (James Quinn) A nice alternative to "make me a channel of your peace". This is sung to the very familiar tune "O Waly Waly". It is also sung in the plural (us and we rather than Me and I), which is nice too. Lyrics can be found here. New words to old tunes. ATOK 390 Put on love every day, never hide your love away (Mary Lou Walker) A fun song for kids! It's a while since we've sung this, but it's fun. Lyrics (downloads a PDF) Good for kids. TiS 414 / CH616 / UMH192 / VU582 / HPP134 / PH433 / GC550 / CP(E) 198 / Cha257 / StF398 There's a Spirit in the Air (Brian Wren) A good song of getting the business of following Christ done. Speaking out, caring for others, being changed. Good, joyful tune too. Seven verses – you might want to have women sing a verse and men sing another to keep people going. Lyrics and a sample of one tune that you could use. *WoV659 O Sun of Justice / Jesu Dulcis Memoria (Plainsong) I really like these words. They can also be sung to TALLIS CANON if you get nervous about Plainsong. CH570 / UMH512 / W&R495 / Cha629 / ZSS164 When the storms of life are raging (stand by me) (Charles Tindley) A good gospel song. It also fits very well with the Goliath reading "Lord, who never lost a battle, stand by me". Hymnals have a range of translations. Sound sample and lyrics. We sing it pretty upbeat. I am going to suggest this song for next week's gospel reading as well, so it might be worth teaching this week! Good for kids (unless you sing it like Elvis). MV153 Body Mind and Spirit (Margaret Motum) A lovely gentle song about Christ as abundant life, resting within us stilling the stormy water. Easy to sing, and quite beautiful. FFS53 Out of the storms and seabirds' calling (Colin Gibson) The song is about people who travelled across the seas to establish a church in New Zealand, but it would work for Australia too. "Out of the storms and seabirds' calling, far from the islands of their birth, leaving an old world half behind them, seeking new paradise on earth, voyagers all, they sailed the future, settled and made this place their home". TiS 728 Jesucristo reina reina ya This fun chorus from Argentina is just lots of fun, and our congregation hasn't sung it for a while. Good for kids. Traditional Put your hand in the hand (Gene MacLellan) This is that song from the 60s that has been recorded by lots of people (even Elvis)! Last time we sang this, our congregation LOVED it. They even clapped! Here's the original recording by Anne Murray (youtube). Recorded Music Into the Deep (Malcolm Gordon) Based directly on this passage "Even the wind and the waves will listen to your voice, oh speak your love and your grace and calm the storm within". Sound sample and purchase options. *BUC Resource Bring me home (Sheree Anderson) Saide has a copy of this reflective song that Sheree wrote in 2006, which we rarely sing. Perhaps the musicians could present it? *Recorded music Storm (Lifehouse) This song could be very helpful, played for a congregation going through difficult times. I usually prefer songs that are more communal than personal, but hey... this would be really helpful for teenagers, I reckon. Youtube with lyrics. 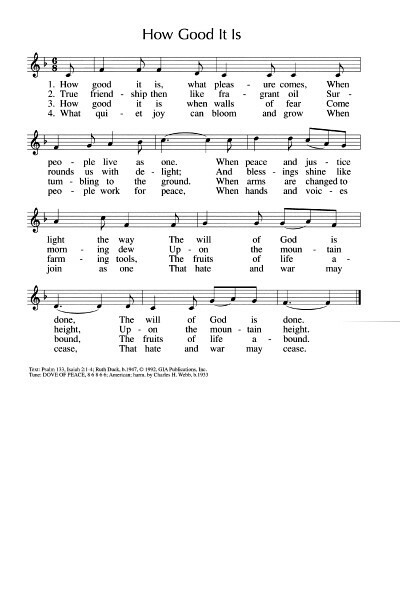 Cha181 The Storm Is Strong (Sylvia Dunstan) Simple story telling hymn. Lyrics and sheet music sample. 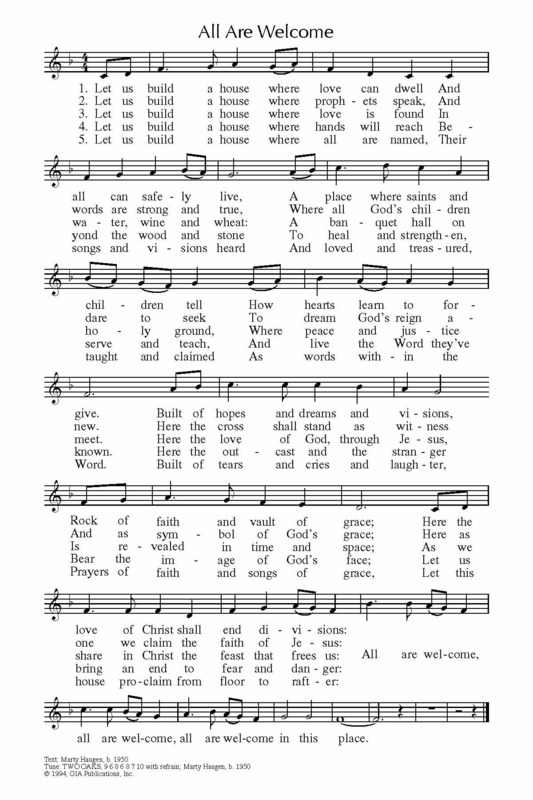 Note that this congregation has split the verses to be sung partly by the leader and partly by the congregation. R263 / GtG184 / ELW794 Calm to the waves (Mary Louise Bringle) I like these words, and the tune is simple. Lyrics. Tune sample. ATAR670 Calm the storm (Jonathan Rundman) Good kids' song based on this passage. Chilled out sound sample. Good for kids. AA156 Where the road runs out (Colin Gibson) "Be the sailor's friend, be the dolphin Christ"... verses 2 and 3 are especially appropriate. Thanks Andrew Prior for this suggestion. Lyrics. What will you be singing? Please add a comment below if you'd like to share. Written on the island of Crete! If you're looking for a nice Psalm 9 tune can I recommend the Psalm Immersions website by Richard Bruxvoort Colligan? He has the song as a pack to purchase, but the songbook for the whole cd is $15US. I am thinking about teaching the song as our come to worship this week. Gospel: UMH 534 "Be Still, My Soul" ; TFWS 2191 "Eternal Father, Strong to Save" ; UMH 509 "Jesus, Savior, Pilot Me"